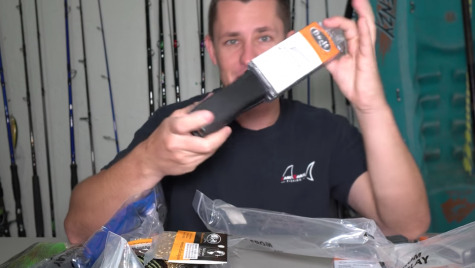 How To: Tips To Save Big On Fishing Tackle! *Lead is known to cause cancer in the state of California. Have you ever wondered how much Lead is involved in the fishing industry? From sinkers to jigheads and so much more, lead is an item that is heavily used to make all kinds of fishing products. Lead is also a bit pricey as a raw material and this carries over to fishing tackle as well. I have always been a huge proponent of DIY fishing projects as well as saving money on my fishing expenses. Let's face it, fishing is EXPENSIVE, but the more you save the more, time you spend fishing. A tip that I have always employed is to make my own fishing weights. In fact I have been doing this with buddies for the last decade. Lead fishing weights cost around $0.40/oz on average and this can get very expensive especially if you do a lot of bottom or wreck fishing. There are dozens of free sources of lead out there, as well as wholesalers who will sell lead at around $0.10/oz on average a 1/4 of the cost of retailers. "I always suggest to people to invest in the molds and melter with a group of buddies and then cast your lead fishing weights ,jigs etc. together." This is where the DO-IT yourself portion comes into play. Well before I partnered up with the company Do-It molds, I had been using their products. They offer a vast array of molds to make any sinker imaginable, on top of dozens of jigheads, jigs, vertical jigs and a ton more. Each mold is around $35-$50 and a basic lead melter is around $75. It's an investment that saves a you a ton in the long run! Take for example, I've gone through ten 16oz lead sinkers before in one trip, had I bought them at a tackle shop it would have cost me between $60-$70, but being that I make my own it cost me $16 at $0.10/oz. Just that one trip would pay for that particular mold. I always suggest to people to invest in the molds and melter with a group of buddies and then cast your lead fishing weights,jigs etc. together. The investment becomes even smaller and will pay for itself even quicker. This is a also a fun project you can take on, in the off season to prepare for the weeks ahead. Do-It molds also has a ton of products in the way of tackle craft, such as making your own bucktail or flair hawk jigs. They have something for every fishermen and it's certainly a company worth checking out! We hope that you enjoyed this article on the Bullbuster community! It is our mission to help millions of anglers spend more time fishing and that starts with YOU!